A recent study conducted by the Institute for Press and Society (IPYS) in Venezuela has confirmed that at least 43 different websites are being blocked in the country, shedding new light on the filtering practices of the Venezuelan government. The research focused on documenting incidents surrounding web access and net neutrality, zeroing in on the treatment of national networks during the 2015 elections. The organization measured connection speeds and blocking over 48 days (from November 25, 2015, to January 14, 2016) and gathered 6.4 million data points. They found that 44% of the websites blocked are related to the black market of currency, while 19% are media-related, 12% are blogs that are critical of the ruling party, and 9% are related to gambling. Some URL shorteners, anonymization and circumvention tools and hosting services were found to be blocked as well. The study also confirmed that all local Internet service providers using DNS (domain name system) blocking, technique through which domain name servers respond incorrectly to requests for a particular domain. When a website is blocked via DNS, the server will reply incorrectly or will deny the request when that website is called upon. The study did not find evidence of other kinds of technical censorship, including IP blocking or keyword blocking. However it is important to keep in mind that the study is a pilot test of only a small proportion of websites that are currently unavailable in the country. Previous research has indicated that roughly 1500 websites were blocked in Venezuela at some point during 2015. At its core, the Internet is a network of computers that can send messages between one another. Every computer and website connected to the Internet has an Internet Protocol (IP) address — a seemingly random set of numbers. The Domain Name System links each IP address to a website URL, allowing users to enter an easy-to-remember name rather than having to remember and type in a long string of numbers. For example, if a user wants to visit our website, she can type globalvoices.org into her browser. This tells her computer to send a request to a domain name server that will then find the corresponding IP address and thus give the user access Global Voices. When a website is blocked using the DNS, the server will either deny the request or send back the wrong information. In 90% of cases, the websites in the study were being blocked consistently across all five of Venezuela's largest ISPs. All appeared to constitute some violation of the notoriously broad Law on Social Responsibility on Radio, Television and Electronic Media, suggesting that the websites were blocked in compliance with an administrative measure under the aforementioned law. More specifically, the Institute inferred that the websites are considered to promote disobedience of the law, disavow authorities, or “foster unrest” within society. The study also indicated that the mobile service company Movistar had the most websites blocked, among them websites that were not blocked by the state-owned telecom CANTV. This could be a consequence of Venezuela's Law on Social Responsibility, wherein ISPs can risk being issued a penalty if they don’t comply with their obligations regarding forbidden content. While the government’s practices regarding Internet blocking are not exactly a secret (this is a government that issued a web blocking order on national television back in 2014), the specific procedures, reasons, and particular websites currently blocked, along with all telecommunications information, is considered a “state secret”. This terminology was used in a 2014 Supreme Court ruling in response to a request for information concerning online censorship filed by Caracas NGO Espacio Público. However, it is known that the National Telecommunications Commission (CONATEL), a body that responds to the Executive branch, has issued procedures against at least nine ISPs for allowing access to certain websites. In a handful of other cases, such measures have been public, such as in the case of the Colombian news channel NTN24, which after providing coverage of the 2014 protests was blocked by all providers following an order issued by CONATEL. 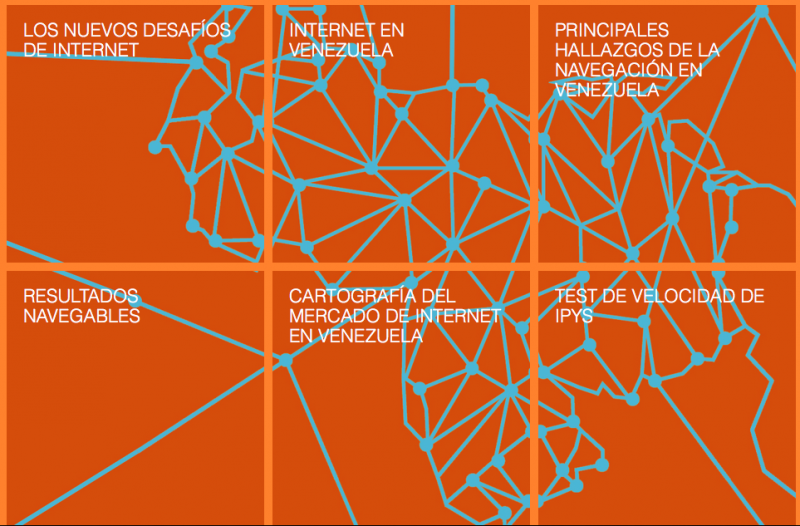 IPYS is currently developing a system for monitoring the limitations to Internet access and net neutrality in Venezuela, drawing from the lessons learned in this pilot study. The entire report (in Spanish) and the original data is available on their website.